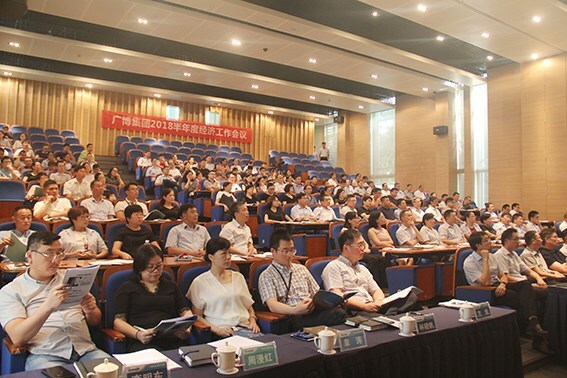 On August 11, Guangbo Group held 2018 semi annual economic work conference. The conference system summarized the development and completion of the work in the first half of the year. The shortcomings and deficiencies in the current work are thoroughly analyzed. At the same time, the key tasks in the second half of the year were deployed. Group leaders, middle-level management cadres, technology representatives, sales representatives, Party members and excellent staff representatives about 160 people attended this meeting. Group president Wang Liping attended the meeting and made an important speech. Group general manager Wang Junping hosted the meeting. Today is the age of information and intelligence. With the rapid development of science and technology, new situations and new things emerge one after another. Management creation is the driving force for breakout of enterprises. Facing a rapidly changing market environment, pressure and motivation coexist, risk and opportunity coexist. Therefore, this semi annual meeting carried out formal reform and innovation. It invited the founder of the seven dimensional leadership model, 985 EMBA visiting professor in colleges and universities, economist Qi Zhenhong to give lecture. With the theme of "controlling trend, reducing efficiency and breaking through innovation", starting from the current political environment and economic situation at home and abroad, using detailed data and real cases explains the great environment and opportunities faced by the current enterprise development. The trend of future development is also analyzed in detail. At the end of the lecture, he also conducted in-depth and detailed exchanges with delegates on how to grasp the transformation dynamics, how to solve the contradiction between production and marketing, and how to retain individual talents. Later, management cadres combined with lessons learned, deeply exchanges work in the first half of the year in groups. Constructive suggestions and suggestions are given for the existing problems and the next development plan. Then, import and export companies, industrial companies, new materials company and digital corporation these four department representatives and one production system representative report and exchange the semi annual work in their respective fields. 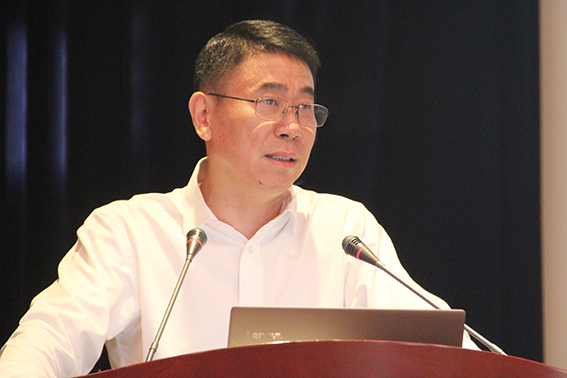 At the end of the meeting, as the important part of this meeting, group president Wang Liping gave the important speech. He pointed out, facing the intricate internal and external environment in the first half of the year, the company has fully implemented the "234" strategic target formulated by the group company. Taking "increasing production capacity, improving efficiency, emphasizing innovation and stressing quality" as the general direction, we must closely promote the development of key industries. Cross border electricity supplier industry explore new mode to achieve rapid sales growth. Deepen reform and new growth points in domestic trade. Accelerate transformation and upgrading, and gradually expand the layout of smart home industry. Continuously stimulate internal innovation and vitality, the new material industry has achieved remarkable results in increasing production and expanding production capacity. Finally, the whole operation of the company is stable. Goals at the beginning of the year were well realized. Wang Liping emphasized, under the current situation of Sino US trade frictions intensified and environmental protection efforts intensified, we should also firmly grasp the opportunities and accelerate the development of the burden reduction policy, quicken the pace of manufacturing transfer and brand export, and actively respond to new market development and challenges brought by the new economy such as the Internet. He pointed out, we should speed up the transformation and upgrading of manufacturing industry with innovative thinking and overall thinking, promoting the construction of automated workshop. Meanwhile, ensure product structure optimization, cost assessment quantification and intelligent production line, truly reduce the cost, increase efficiency and improve quality. He also said that for some time to come, need to step up the layout of new industries such as new materials, cross-border trade, smart home and other new industries. Speed up innovation and R & D capability, speed up the development and layout of new markets and new customers. And on this basis, further promote the building of brand strategy. Stationery brand should make clear brand positioning and identify market segments. Ensure the improvement of customer loyalty. Service brand should lock in target groups, identify service directions and create professional programs. Finally, Wang Liping called on all cadres. Should remember your heart and try your best. Take "producing high quality products, providing good services, creating growth platforms and sharing development achievements" as our mission. Carry forward the quality of sincerity and trustworthiness. We should give full play to the spirit of seeking truth and innovation, strive hard and forge ahead, striving to achieve the goal of the second half of the year, striving for Group’s comprehensive strategy.